The USC Marshall International Business Education and Research MBA or IBEAR MBA, is a one-year, accelerated, full-time, international MBA program designed for mid-career professionals being groomed to assume senior global positions. The duration of the program is just 12 months. Students meet daily at USC’s Los Angeles campus. The USC Marshall IBEAR MBA class size is limited to no more than 60 participants per year. There is one intake per year, and classes begin during the fall semester. Participants complete 19 courses and earn 57 credits over five intense eight-week terms. The curriculum includes IBEAR courses, electives at Marshall and other USC schools, retreats, networking events, and multiple international travel study components, besides a four 1/2-month long management consulting project. The USC Marshall IBEAR MBA curriculum comprises 19 credit courses delivered over its August Transition Program and five eight-week terms. Sixteen of the19 courses are mandatory core courses required of all participants. Three IBEAR courses are optional and can be replaced by MBA electives of the participant’s choice. Electives are taken with students in other Marshall MBA programs such as the two Year MBA or MBA.PM programs. The capstone course of the program, the International Business Consulting Project or IBCP, is a client commissioned consulting engagement that integrates all previous course work into a real-world cross border business experience. The typical USC Marshall IBEAR MBA class is comprised of 29% students possessing advanced degrees. Students in the program have an average GMAT score of 630, with an average of 10 years of work experience. The average age of matriculating students is 33. No more than 60 participants are enrolled per year and the current class size is 56. Nearly 57% of IBEAR students are married. IBEAR MBA career services is tuned to the unique needs of its mid-career participants. A dedicated career development counselor with international executive placement experience provides an individualized career development plan for mid-career professionals. Extensive career planning along with resume preparation, interview training, career management training workshops and on campus recruiting and interviews are some of the key initiatives of the career development counselor. 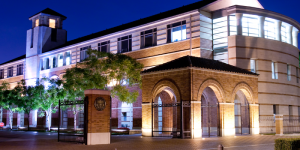 In addition to USC Marshall School of Business’s professionally managed Keenan MBA Career Resource Center, the IBEAR MBA program has its own dedicated career development advisor whose background includes placement search with several multinational companies. The estimated total tuition and fees for the USC Marshall IBEAR MBA is $100,260 and estimated living expenses of $25,000. Multiple scholarship and financial aid options are available to self-sponsored participants. IBEAR Global Business Fellow scholarship offers partial to full tuition awards to high potential international and US candidates. The Hanjin/KAL Scholarship is awarded to one Korean/Korean American participant each year, while the Honjo Foundation/J.G. Scholarship is offered to one deserving Japanese candidate every year. IBEAR Distinguished Graduate Scholar offers merit scholarships to candidates at the top 20% of their IBEAR class who wish to pursue additional graduate study at any USC graduate school upon completion of their MBA. To apply to the USC Marshall IBEAR MBA program, applicants must submit a completed application form, all college transcripts from degree-granting and non-degree-granting institutions, a current résumé, two letters of recommendation, and one passport sized photo. The school also requires applicants to complete one essay about their leadership experiences and goals; applicants may also submit an optional essay for any additional information you wish to convey to the Admissions Committee. Applicants must also send in their GMAT or GRE scores and a nonrefundable $150 application fee. Interviews are conducted by invitation only at the discretion of the Admissions Committee. On campus interviewing is preferred. All IBEAR MBA applicants must have at least six years of professional experience and a Bachelor’s degree. GMAT scores are typically 630 and must be at least 570. All international applicants must also submit TOEFL, IELTS, or PT scores in order to apply. IBEAR employs a rolling admission system: Application forms are reviewed as soon as an application file is complete, beginning in November. Students are encouraged to complete the application file before June 15.